We figured out how to talk to it, use the DB9 to connect to it; 9600BPS 8n1 , hardware flowcontrol (rts/cts). Use the information in this document to write your own driver/application that sends commands directly. This means that you will need to be careful with it. Consult someone experienced with the machine if you are going to do something *special* that risks jamming the machine, putting undue force on parts, make dust/smoke/shrapnel, etc. Please also take care of personal safety. The tool-arm does not have a soul nor eyes. It wont care that it smashed into your glasses while you were too close to it. 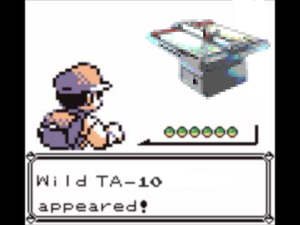 UPDATE*: We received a document from a kind person on the InterNetz who is in the possession of a Wild-TA10 as well. Accompanying that machine was a set of instructions relating to a TA2 model which has been scanned and turned into PDF and contains a wealth of information about the machine; relating to the use and care of it. The TA2 seems to be only a slightly different machine than the TA10 is. There is a project-box related to this device. It contains a number of parts and accessories to the device. Including the cutter-head and adjustment-collar. Please return the pens and/or cutter-heads back to the project-box for safe storage. There is a significant risk of the tool-grippers breaking if a tool is left stored on the device when not in use. Since they are stiffly fixed to the tool-gripper, a simple bump against one of the tools might cause the tool-gripper to break (again). The device has a tool-arm (grey) with a default solenoid-based toolhead attached to it (orange). The default tool-head can be either replaced or augmented; bolt-holes on the side of the tool-arm allow you to fix extra equipment to it. An internal DB9 interface (under orange plastic) allows you to create an interface between plotter and extra tools. The DB9 carries solenoid-signals, light-power, accessory-power and possibly more (FIXME: documentation needed). There is also a connector that seems to be meant for some thin-coax cable; possibly for sensing purposes. The device features a large cutting bed made of a transparent material that lets the light through of the dimmable Tube-light array behind it. Please find the white dimmer-switch on the backside of the device. The bed seems to be fastened to the frame of the device with a series of spring-clamps which seem accessible for replacement/adjustment by accessing the inner space of the table by undoing the back-panels on the back of the table. When using markers with NONpermanent ink (aka: whiteboard markers), one can easily test a design first by drawing directly on the bed's surface. The bed is then easily cleaned with a damp cloth. Also on the backside is the tilt-lock handle for the table's angle. BE CAREFUL when pushing the articulated handle up; the weight of the table is considerable! The telescopic arm does have a spring inside to help carry some of the weight, however. Be ready to support weight and slowly unlock the handle until the table starts to move. Make sure to relock securely. Table can be put down until perfectly level and up until nearly upright. BE CAREFUL PUTTING IT TOO FAR UPRIGHT; the weight of the table is then all on one side; there is a risk of the device FALLING OVER FORWARDS. The whole table is supported by a hinge-assembly and a telescoping arm (see tilting, above), on a base-unit which houses the power-supply and the control-unit of the device. The control-unit consists of an small internal 19" controller-card rack which houses a number of user-replaceable cards. Some are obvious communication and servo-amplifier cards; others are less clear. Card-positions are listed on the inside of the hatch. On the other side are a series of fuses and an hour-of-service counter on the hatch that covers the Power-supply of the device. There is a control-pendant that's attached to the device by a cable and can be fixed to the side of the table by means of the magnet on the back of it. It provides step-precision control of the head, choosing the pen and setting a number of parameters of operation (window, origin, etc). Keeping the direction-control buttons for longer periods will increase the speed of the head. The control-buttons on the edge of the table also allow for a number of the controls that are possible via the control pendant; as well as allowing you to switch the device on/off and such. On the left side, next to the cutting bed, there is a trough that allows rolls of base-material to be kept there; unrolling a section of it across the bed for cutting/plotting. There is a matching tool-holder that fits in this trough that houses pens suitable for the machine. There is a cutting-head accessory that came with this device. It's main function is as a servo/stepper actuated roto-knife that makes sure that the knife cuts in the direction of movement that the tool-arm is heading. This prevents the need for resorting to a swivel-knife that'd have less perfect cuts in designs with a lot of angles. The cutting-head comes with an adjustment-collar that allows for easier depth-control. Find and return both the cutting-head and the adjustment-collar to the project-box they are stored in. Since the cutting-head protrudes quite a lot from the tool-arm, there is a great risk of damaging the tool-clamp if the cutter-head is left stored in the device when not in use. there is a VIA C3 pc, made of lego. it needs to be plugged in and attached to the network via the lack rack. it currently sits on the base of the plotter itself. login to the box. make sure your user is part of the dialout group. this script will setup the correct port settings and do all the conversion and make the plotter 'print'. The settings should be 9600 8n1 with flow control on. this will output commands to the screen. 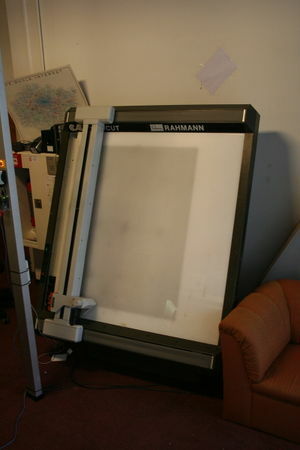 if you output to a file, this can be used to send all commands to the plotter in one go. the output file will also contain the 'initialisation' commands. The current plan is to work on fixing a number of defects on the table and making a software-layer between the 'broken hpgl' of the device and 'the real world'. Part of this work will be done during Tinkering thurs/tuesdays. See 'features' for some of the jobs that need to be carried out. This draws a simple square (see the commands starting with 'U'). The P1 command does the pen select (P2 for the other pen). - Some references (eBay auctions et al) list HPGL (overview) as a way to talk to it. But often together with some interface box so this might not work for ours. Throughout the continuing efforts of trying to figure out how to drive the machine, the innards of the unit have been on several occasions. In an effort to document what was found in a way that won't pollute this page with non-essential information for those using the machine, a page has been created to collect all the findings. Please find Wild TA-10 Innards. Hardware-interface	RS 232C 9600 bps, 8,n,1 hardware flow control needs to be on, otherwise it will drop plotter commands. Output via a USB->Serial converter has not been successfully achieved yet but should in theory be possible.